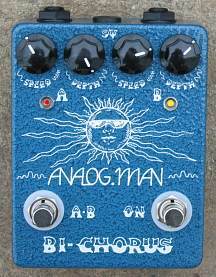 Analog Man presents - The Bi-Chorus. The BI-CHORUS offers two sets of SPEED and DEPTH knobs, allowing two different settings to be selected without having to adjust any knobs. Not two pedals in one, but two sound presets. Also optional TRUE STEREO outputs! In January 2005 we came out with three new pedals, two were chorus pedals. The BI-CHORUS is one we have custom made until now, in random cases. Now we have had a batch of aluminum Hammond style die-cast boxes professionally powder-coated and silk-screened for the first production version. Though the Standard Chorus has been selling better than ever, we thought it was time to add some cool features without changing the awesome tone of the pedal that we have spent years refining. And I had been enjoying my custom BI-CHORUS on my pedalboard for some time! The BI-CHORUS offers two sets of SPEED and DEPTH knobs, allowing two different chorus settings to be selected without having to adjust any knobs. Not two pedals in one, but two sound presets. The Bi-Chorus is available with SIDE JACKS or TOP JACKS (as shown above) to allow close fitting or cleaner wiring on pedalboards. Side jacks have the INPUT and OUTPUT jacks on the right and left of the knobs as shown below on the stereo BI-CHORUS picture. Other chorus pedals do not have optional top jacks, just the BI-CHORUS. BLINKING super bright LEDs. The selected side's LED, when ON, will blink in time to the chorus speed setting. One is RED and one YELLOW. MIX trim pot is inside the pedal, to allow adjusting the wet/dry mix. See OPTIONS below for more info on what MIX does. Not a huge fan of chorus... till now! This one has a thickining sound that makes my clean sound more noticeable. In this setting, with depth all the way up and speed all the way down, it acts as if it wasn´t there, but makes all the difference! Needless to say that the leslie sound is out of this world. A kidney punch for Mike for this one! I needed a chorus pedal to round out my new studio/live pedalboard. I'm not a huge fan of chorus, but a close friend turned me onto the Bi-Chorus, and holy cow!! It sounds great, and the two-in-one pedal lets me cover everything I need live in one pedal. The toggle switch makes the Bi-Chorus even more versatile! I'm thrilled to be using Analogman in my rig! For anyone wondering which chorus to buy, this is the one. I just sent one back for a mod and first put a 1981 CE-2 on my board to use in it's absense. It sounds very nice and can do the Brass In Pocket sound perfectly but didn't have enough depth. I tried a CE-2 I had on a shelf with the Keeley mods and it was good too, but not as good as my AnalogMan Chorus which I got back today and put back on the board. Thank you Mike for all the great sounds. I have never heard such a pure and warm sounding chorus. So this is what chorus is supposed to sound like. Now its my favorite effect. Love it on my Taylor 210ce. Also sounds amazing on solos similar to Nirvana or SRV. Mike, the Bi-Chorus with the added toggle is definitely worth every penny. Has a very Leslie like sound and can get the warble if needed. Thanks again for designing and bringing to fruition the best pedals on the market.